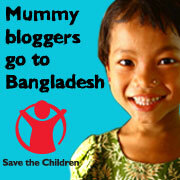 Chiswick based blogger Eva Keogan joins two other bloggers Josie George and Sian To to blog their way to Bangladesh for Save the Children. They will be tweeting, posting videos and photos and writing about their experiences seeing first hand what Save the Children is doing out there for parents and children. Every year almost 9 million children under the age of five die, most of them from preventable things like diarrhoea. We can change that. Passionate about our work and ready to flex their multimedia skills to campaign for change, our bloggers are going to be tweeting, creating video and photo galleries and writing about their experiences live and direct from Bangladesh. At the end of September Nick Clegg will be at the UN Summit in New York. Ten years ago world leaders set targets, called Millennium Development Goals, to reduce poverty, hunger and disease. Save the Children want to gather 100,000 signatures on their facebook petition to make sure he understands how much we care and that it’s vital he holds world leaders to account. "This is a really unique way to engage in social media. I want to make sure we highlight the great work being done, as well as the issues faced by children and mums."